Discussion in 'General Polls' started by Howie, May 10, 2015. Which version of Fanta orange do you like best? If you've ever crossed the Atlantic on your coaster travels, you may have noticed that Fanta orange in Britain is very different to the Fanta orange served up Stateside. American Fanta is a much darker colour (or color, if you must), sweeter, smoother and considerably less fizzy, whereas in the UK it's a much tangier, fizzier, paler affair. My question is; which do you prefer, and why? Personally I'm in the UK camp, I think the American Fanta orange is awful! It looks radioactive and it just tastes.... what's the word? Artificial. Give me the British version anyday, much more refreshing. On the other hand, Fanta does come in some cool flavours over there, Fanta grape for example, and Fanta pineapple. US Fanta every day of the week. Yes it does look radioactive...and it does taste artificial, hence why I prefer it. I can literally feel my veins and arteries get filled with sugar when I drink it. Perfect. Nooo that sugary-ness is what makes it so awful! In desperation I turned to Sunkist, and it's the same story there, loads more colouring, loads more flavouring, loads more sugar.. and less fizz. It's just wrong. I mean, it is America after all. Everything has more sugar and is more artificial. That being said, I like me some Fanta Orange. I don't drink pop any more but when I did, it was one of my choices alongside Pepsi and IBC Root Beer. I drink Fanta in every country I visit (if they have it) and I'm on the European Fanta bandwagon. I like the fact that each country in Europe have their own flavor of orange Fanta, with the UK's among the best of the lot. Of course, I grew up drinking the German version, which is lighter on the orange than the UK's, but not as "watery" as the Netherlands'. But every European version of orange Fanta is better than the nuclear America kind. I'd heard that it was different again in Europe, but didn't realise it varied from country to country. Tried it in Egypt once and it was more or less like the American one. Now normally I'm a big fan of all things American, but Fanta orange is definitely one of those things that makes me glad to be home! Anything artificially grape reminds me of that vile grape kids medicine. I'm on team USA for the time being. I haven't tried the UK version, so I can't really choose. US Fanta! It is amazing and actually tastes of orange. UK Fanta is nice but tastes a bit watered down. Santa Icy Lemon is too amazing. European Fanta is weird. I had the blue one in Sweden, horrific. UK, US Fanta made my teeth dissolve. This is fascinating - blue Fanta in Sweden, elderflower Fanta in Slovenia... what other weird and wonderful flavours are there from around the world, I wonder? 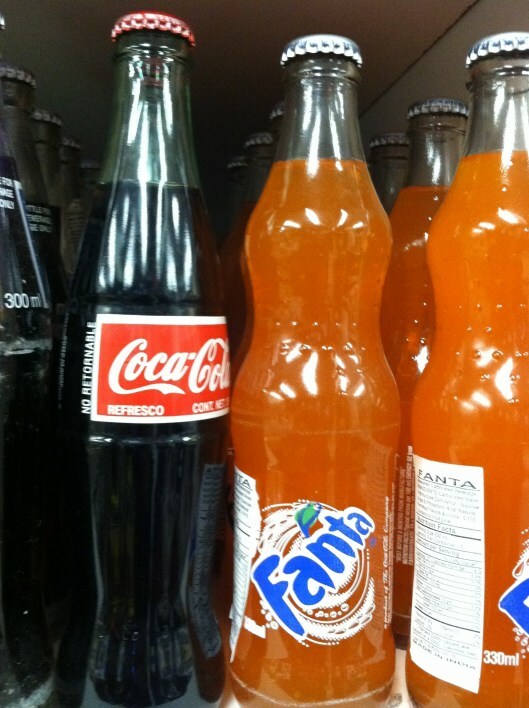 I wonder if Canadian Fanta is the same as American. I've tried the Canadian one, but it doesn't compare to UK Fanta. Although, orange Crush trumps them all. Uk Fanta contains actual orange juice. The US one is sugar and flavourings. It's ing disgusting. Out of those two, UK. However if you like radioactive coloured Fanta, Japan wins that game. The mystery flavoured green one is epic, looks and tastes like toxic waste, kinda disgusting and amazing all at the same time! US Fanta is actually vile. Lemon Fanta in Europe is just...yes! I'm not a massive fan of the luminous stuff, but it's fine for something different. In Ireland they have a drink called Club Orange which is like a mix of Fanta and Orangina. It's delicious.